Dwelley caught two passes for 14 yards with the 49ers this past season. 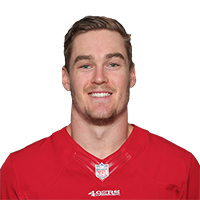 Analysis: Dwelley was promoted to the team's active roster Week 6, but he spent most of the season on special teams, only logging 39 offensive snaps over 11 games. The undrafted rookie will battle for the 49ers' third-string tight end job next season with both George Kittle and Garrett Celek locked into the first two spots on the depth chart. There are no videos available for Ross Dwelley. Click here to view all videos.